Gulf Shores Alabama beachfront condo for sale at Lighthouse. Awesome Floor-plan ~ One Bedroom With Bunk Room (Makes This Feel Like A Two Bedroom) Beautifully Decorated Gulf-front resort home in Gulf Shores' Most Popular Complex All Within Walking Distance to Festivals, Restaurants, Shopping, Beaches and More. Travertine Tile Throughout. 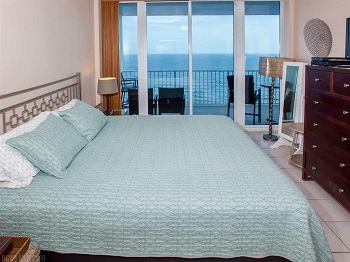 Gulf-front Master Bedroom With Access to Private Balcony Offering Breathtaking Views - See 20 Miles Of Beach. Dual Vanity with His and Her Sinks, Jacuzzi Tub with Separate Stand Up Shower in Master Bathroom. Tile Flooring Throughout. Lighthouse Features First Class Amenities: Sun Drenched Deck Encircles Two Outdoor Pools, One Zero-Entry, Two Hot Tubs, Sauna, Exercise facility, On-site Management, Covered Parking and BBQ Area. Great Opportunity To Own A Piece Of Paradise. This resort residence is being sold furnished. Thanks to the semi-tropical weather, the Gulf Coast has an abundance of outdoor activities and overlooks the warm waters and white-sand beaches of the Gulf of Mexico, making it a popular family vacation destination in the southern & eastern United States.